Bryce Harper to the Giants seems to be gaining steam everyday, and may have reached a tipping point on Monday. Online sportsbook BetOnline posted odds on who will end up with the former MVP this offseason. The Giants not only have the best odds, but are listed at 1 to 1, meaning that if Harper signs with San Francisco, you would receive a 100 percent return on whatever you bet. Behind the Giants are the Padres (5 to 2), Phillies (4 to 1), Dodgers (15 to 2), and Nationals (10 to 1). 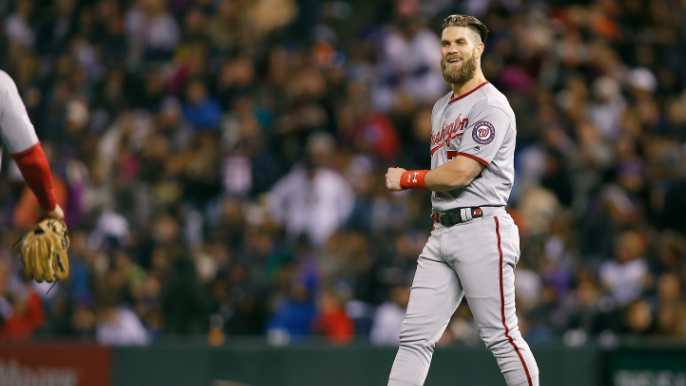 The Harper to Giants rumors reignited last week after the club’s brass had a four-hour long meeting with the six-time All-Star in Las Vegas. Farhan Zaidi confirmed that there is mutual interest between the two parties, something Larry Baer reiterated at FanFest on Saturday. Two separate reports also surfaced last weekend, one detailing that Harper made it clear he’s a big fan of Buster Posey during the meeting (something that seems to be mutual), and that the Giants are going to offer Harper a lucrative short-term deal, as opposed to the 10-year, $300 million offer Harper reportedly turned down from the Nationals earlier this offseason.